Good morning to all my friends and anybody who has just dropped by. Hope everybody is keeping well. It is more like April than May we are having so many heavy showers. Another two weeks have passed and it is Rita's turn to choose our topic for the Christmas Card Club, which is to depict a Village Scene. When I first started card making, seems so long ago, I bought two Christmas stamps and this is one of them. I really love them both. They were made by an American company called PSX which no longer exists. I have a number of other PSX stamps and they are fabulous - so detailed and deeply etched rubber. I cut my base card and folded it to 5" x 7". I inserted the front into the embossing folder and then inserted the inside and embossed it so that I would get the embossed side on both parts, rather than a de-bossed inner. After stamping the image in French Navy Fabrico ink I used lashings of Twinklets Diamond Dust to make it very icy. All it needed than was die cutting some of the blue and white card to frame the image. I added some pearlescent snowflake peel offs for a little more sparkle. Well, it's Christmas!!! I hope you enjoy the rest of your weekend, particularly those of you who are still at work - these days are so precious! A really lovely card, the stamp is gorgeous. Love it. Love your beautiful "scene" card. Great colours, sentiment and design. Hope all is well, thinking about you. (((((Hugs))))) for both of you. 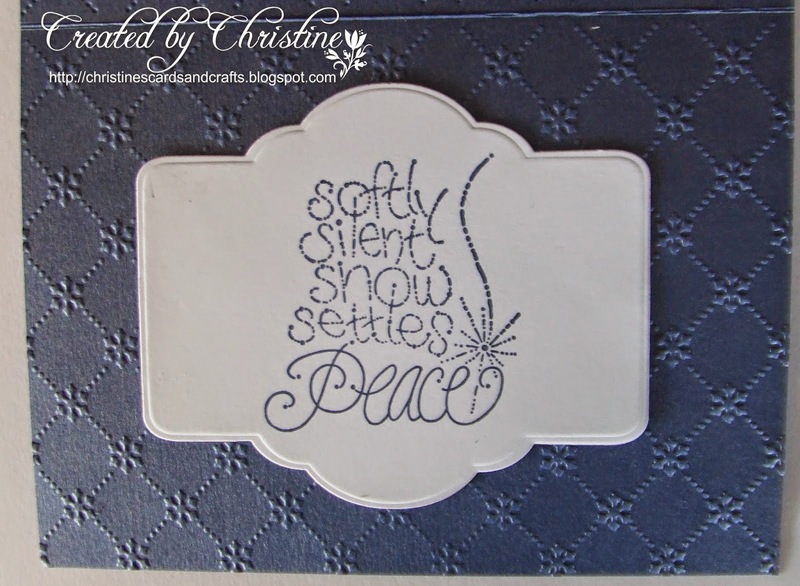 What a gorgeous stamp Christine, no wonder it got you hooked on to stamping. You have created a beautiful card with it and the embossing sets it of wonderfully. 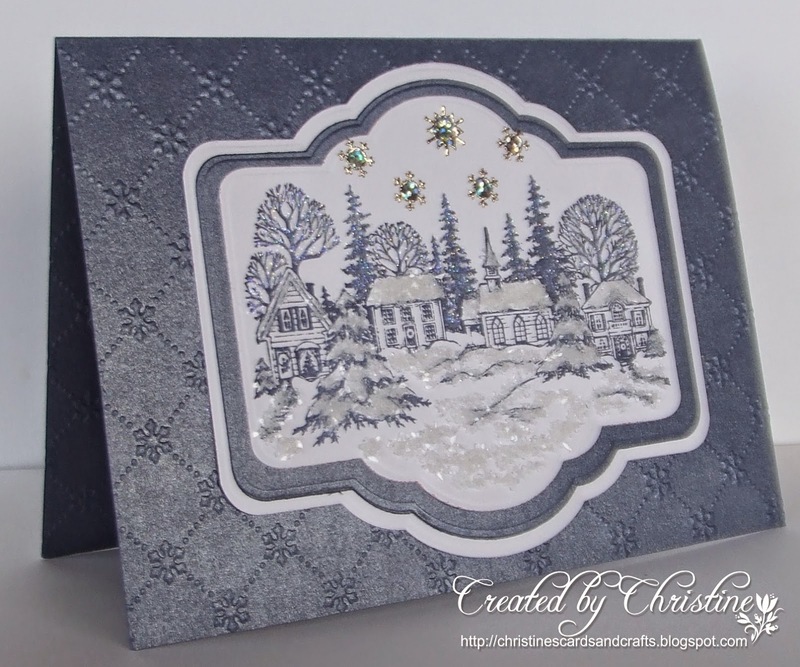 A gorgeous scenic card Christine, love the colour scheme too. What a glorious stamp Christine - I love those 'etchy' style stamps and have recently found mine again!! lol The colour of that card is wonderful, must check out where you got it from! Take care of yourselves. oh this is so lovely, and what a very fab stamp to own. Your creation is perfect, and I love the colour choice too. Me thinks I need that embossing folder, as it's very lovely. Love and biggest hugs to all the H household. 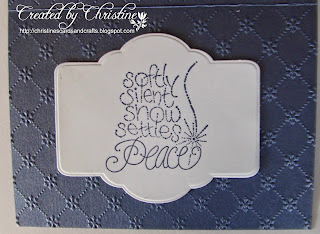 This is gorgeous Christine, such a beautiful image, pretty colours and I love the embossing. And some of us work Sundays too with a dodgy wrist lol! Love that stamp. Gorgeous village scene and all your frosty sprinkles! Simply just so very lovely. You've used some of my favorite products to make this wonderful look. Can't beat PSX stamps for the fine detail and beautiful images. Sadly, they were out of business before I took up this hobby, so I had to play catchup - and don't have a lot of them. Some great botanicals though. I love that you chose the soft blue gray for the colors...it has a very winter feel. The SW dies are perfect to show off the village, and I love this card a lot! Well done. TFS & Have a wonderful week. Wow, I love this monochrome card! You,ve done a great job Christine. Hope the weather will be a bit better this week, because we're coming across the Northsea to Beaulieu (New Forest) visiting the Classic Car jumble. Henry needs a few things for his classic car and we will make the first trip this year with our motorhome! Over here it will be a warm day..
Beautiful image, love the blue and white you've used as it adds to the frosty feel! That is one seriously gorgeous card Christine. Christine this is really gorgeous. So sorry I'm late in commenting. My Internet problems are consuming my life at the moment. To cap it all my iPad crashed this morning and took my IT specialist a talk through on the phone to get it working again. It's enough to drive you to drink. In fact sitting in the garden right now with a Pinot Grigio Blush. Very nice it is too. Anyway I digress. Your stamp is perfect for this challenge. Such a shame that so many companies have gone . Clear stamps are not always the way forward. Love the look of your card. Hugs Mrs A.
Oh my goodness Christine...this card is beautiful! Love the embossed background and the beautiful image and also the great sentiment!